happens when you’re in the moment and your moment awaits here! A mouthwatering meal on a patio or in a candlelit corner, a special glass of wine or a cold brew, or a special cup of coffee to start your day. A concert on the river or at The Beacon and they play your song. When you feel the adrenaline rush as the racecar engine fires, or you jump and the parachute opens, or you are on that exciting zip line! It could be a quiet moment on a kayak, or hiking or biking the trails along the rivers, through the battlefield or historic neighborhoods. Perhaps, when you are struck by the rich history on hallowed grounds, historic homes, courthouses, churches; the stories of valor in military museums, of perseverance of African Americans. Or your moment may come in a shop or a gallery, or when you visit a farm, meet the cows and eat ice cream, or you see the tractors and antique toys that take you back to a childhood memory, or when the giraffe playfully eats out of your hand. Those are but a few of the moments that are here just for you! L VE our FOOD Perhaps you are visiting our region to explore our history, or maybe you are stationed at Fort Lee, or you are our neighbor, or simply passing through, whatever brings you here, the dining choices are abundant. If Southern comfort food is what you love, we have it in plentiful supply. Love to dine on the waterfront, we offer that too. There is also Cajun and vegan. Barbecue – it’s pretty much a designated food group around here. We are proud to share that King’s Famous Barbecue Sauce and Saucy’s Bar.B.Q. have been touted in Southern Living. When we make local dining an integral part of travel, we elevate a trip from the ordinary to the extraordinary. Many of our historic buildings house wonderful eateries and whether you are dining by candlelight or cozying up to a Pub bar, you can appreciate the history of our area while experiencing our local food. Visitors often feel like locals because of the warm welcome they receive and the people they meet while here. We like to think that we serve up a healthy dose of Southern Hospitality! Farm to Table Many of our restaurants source ingredients from local suppliers and growers, embracing the farm-to-table movement. We also have Farmer’s Markets selling seasonal produce, local eggs, pasture-raised meats alongside the creations of our many artisans. Youâ&#x20AC;&#x2122;ll find many international styles of food in our region: Italian, German, British, Greek, Mexican, South American, Japanese, Asian Fusion, just to name a few. There is so much variety and so many interesting cuisines to try! Enjoy the outdoors here! We sit along the Appomattox & James Rivers; Lake Chesdin is between Dinwiddie and Chesterfield Counties. Trails take you through the woods, along the rivers, and through our history. The Appomattox River Trail will soon be 22+ continuous miles. Along the Appomattox there are 10 parks, a conservation area and marinas, so come with your boat, canoe or kayak, and bring your fishing pole. The James River brought settlers here originally and more parks, trails, and conservation areas are waiting. Visit Hopewell’s City Point and absorb the beauty of the confluence of our two rivers! Pocahontas State Park has some of the best single-track mountain bike trails in Virginia. The 7,900 acres of Pocahontas State Park offer 64 miles of trails, including mountain biking & horseback riding, two lakes, an aquatic center, boating, camping, a nature center, concerts in the amphitheater, and more. You and your horse are welcome to the trails of Petersburg National Battlefield – enjoy the outdoors and soak up some history, so don’t forget those walking shoes. Another walk through history is on the Breakthrough Battlefield Trails at Pamplin Historical Park. The Next Inning is Right Around the Corner! No matter the season, the game is always on in The Best PART of Virginia. Our quality sports complexes attract youth, high school, college and adult baseball, softball, soccer, basketball, lacrosse, field hockey and swim teams from around the country. Get ready to hit the links! Our region is home to courses perfect for the experienced golfers and bright-eyed beginners alike. Action – Adrenaline – Adventure The Best PART of Virginia is not for the faint of heart. The roar of the dragsters’ engines, a freefall from the sky, a zip line high above the zoo, 20 epic obstacles including a fire jump at Rugged Maniac, bouldering and climbing, trampolines, glow in the dark jumping & dunking! Whether it’s musical, visual or performing arts, venues are located throughout the region. Friday for the Arts is a celebration every 2nd Friday night of the month in Old Towne Petersburg: gallery shows, dining, wine tastings, live music. 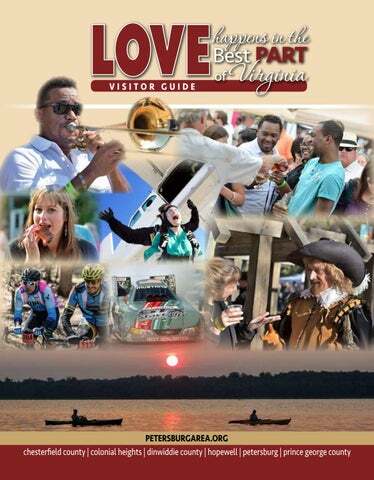 Experience the Petersburg Symphony, Chesterfield Concert Band, Tri-Cities Community Band, concerts at Pocahontas Park, on the lawn at Weston, at the Appomattox Boat Harbor, the Hopewell Marina, or the VA Opera at Battersea. Live theatre happens at the 350 year old Swift Creek Mill, Fort Lee Theatre Co., Appomattox Governor’s School and the Illuminated Stage Theatre Co. Drag shows are popular throughout the region. The Beacon Theatre A shining 1928 beacon for Hopewell’s downtown and for all looking to be entertained. See the Old Dominion Barn Dance, or the Masters of Motown, the Oak Ridge Boys or The Winery Dogs, the Ultimate Queen Celebration or Graham Nash, all up close and personal – Feel the Vibe! As the art community grows here, the conversation about what we share as people becomes more nuanced, deeper and richer. The region offers history, diversity, sense of community, and progressive attitude that complements all the attractions and things to do. Shoppers know the fun is in the finding. Shops are filled with wonderful, authentic, and quirky antiques in Old Towne Petersburg, downtown Hopewell, Colonial Heights and Chester Village, but there are also treasures to be found along our country roads. All are local treasure troves of history and stories. You can also find specialty gifts, vintage clothes, locally-made crafts and more. L VE our HISTORY Put PART of America’s Past In Your Future History is all around us; visitors have been coming here for over 400 years. From colonial settlers heading west to British soldiers fighting to keep the land, from Union & Confederate troops ending a long war to Czech & Slovak immigrants coming to begin a new life, from those training to defend our country to the Civil Rights leaders seeking equality, and those who come every day to experience our past, history is all around, but sometimes easy to forget. In many places, the last vestiges are fading away. But you can still find local museums and historic road markers guiding you to early settlements, plantations, monuments, earthworks, and trails that are tucked away from the rest of the world. We’re here to tell you that not only is history worth the effort, it’s easier than ever to go out and reconnect with the roots of America’s story right here in The Best PART of Virginia. While living at Henricus, Pocahontas took the English name Rebecca. She met John Rolfe and they were married in April 1614 at Henricus. Duty Calls Me Here brings visitors face-to-face with the soldiers. Personal digital players allow visitors to follow soldiers through 7 galleries using interactive computers, videos, life-sized dioramas, 700 original objects and multi-sensory battlefield simulation, Trial by Fire. The digital players continue to provide information as you move throughout the entire property. The Civil War remains a defining period in American history because America does not have an uncomplicated past. In our present day, we continue to find ourselves polarized over nationalism, race, and freedom. Petersburg’s historic sites and battlefields helps us understand the potential fragility of our republic. Petersburg National Battlefield The Longest Siege on American Soil Almost one quarter of the Civil War was fought here as Generals Lee and Grant battled for control of the railroads that the Confederacy desperately needed to survive. Petersburg National Battlefield tells the story of the long siege that resulted in the fall of Richmond and the war’s end. General Grant’s Headquarters at City Point Now the City of Hopewell, Grant established his headquarters at City Point, a port town at the confluence of two rivers. Overnight, the town became one of the busiest ports in the world as hundreds of ships delivered food, clothing, and bullets. The Eastern Front The Eastern Front features exhibits and audio-visual programs that introduce the story of the siege and its impact on the course of the war. Walk the battlefield to find the infamous Crater! Five Forks Battlefield One day before the Breakthrough, Union General Sheridan’s men overwhelmed Gen. Pickett’s soldiers at this pivotal road intersection, Five Forks, and the battle became known as the “Waterloo of the Confederacy”. Poplar Grove National Cemetery Over 6,000 Federal soldiers who fell in battles from Petersburg to Lynchburg have their final resting place in Dinwiddie County. African-American churches served as pathways to both spiritual and physical freedom during slavery. Follow the Trail through The Best PART of Virginia to learn about the courage shown by those who pioneered the equality we enjoy today. Heritage Trail listings on petersburgarea.org. Haunted history is everywhere— from Civil War soldiers walking the battlefields and the halls of stately mansions, to paranormal investigators leading Spirited History Tours through historic jails and courthouses. An effective move into the future requires an accurate understanding of the past for the Czech Slovak community in Virginia. Centre Hill is situated five acres overlooking the Appomattox River, and is prominent in the vista heading south on the Boulevard from Colonial Heights into Petersburg. The property retains the remnants of a brick wall and a wrought-Iron fence. The Garden Club of Virginia has restored its landscaping. The mansion was featured in Steve Spielberg’s movie “Lincoln,” filmed in Petersburg just before Christmas 2011. The property is now Centre Hill Mansion Museum, a city of Petersburg museum. It features many superb 19th and 20th century pieces of furniture and decorative arts, many with local significance. The property is on the National Historic Register, and the museum is open Saturday from 10a to 5p and Sunday from 1p to 5p. The last tour each day starts at 4p. Admission is charged, and tours are given every half hour. The site includes an orientation exhibition and gift shop with a fine selection of books. Please call 804-733-2396 for information and group tours. Blandford Church is the “oldest structure in Petersburg with a clearly documented history.”13 states donated windows, as did the LMA and Tiffany himself. These magnificent windows have made Branford Church a national art treasure. Blanford Church is on the National Register of Historic Places. 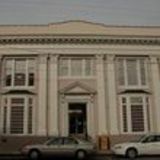 The Exchange Building is the only National Historic Landmark in the City of Petersburg. The Exchange in Petersburg is most probably the last, unaltered Merchants Exchange in existence in the United States.” Visitor’s Center hours will be Thursday through Saturday from 10am to 5pm and Sunday from 1pm to 5pm. Please call 804-835-9630 for information. We are operating with winter hours to 4pm. The Farmers Bank of Petersburg is one of the oldest bank buildings in the United States. and perhaps the oldest in Virginia. Group tours are available. Please call 804722-0198 for more information. We encourage you to shop locally while you enjoy your stay in our community.